Chevrolet was starting to make competitors nervous with the introduction of the 1966 Chevelle. In the name of horsepower, smaller engine choices were dropped and the horsepower was creeping up. Notable changes were restyled body panels, a new grille and rear panel, new interior, and many other changes. The 1966 Chevelle boasted an entirely new look and feel with a more stylish roofline and the famous Chevrolet “coke bottle” shape. The 1966 Chevelle Super Sport was renamed the “SS396” to designate the new power plant and also received a pair of ornaments on the hood. The 1966 Chevelle was available in several trim levels including the Chevelle 300, Chevelle 300 Deluxe, Chevelle Malibu, or Chevelle Super Sport. Each configuration could be ordered with a six cylinder (except SS) or V8 engine. Body style included 2 door sport coupes, 2 door sedans, 2 door convertibles, 4 door sedans, 2 door wagons, or 4 door wagons. Interiors could be optioned with either bucket seats or bench seats and were available in a variety of colors. The most popular were Aqua, Aqua two tone, Black, Light Blue, Blue two tone, Bright Blue, Bronze, Fawn, Fawn two tone, Red, or White. The buyer could have ordered a number of different exterior colors including Tuxedo Black, Blue Charcoal Metallic, Provincial White, Mist Blue Metallic, Royal Mist Metallic, Marina Blue Metallic, Laurel Mist Metallic, Cypress Green Metallic, Artesian Turquoise Metallic, Tropic Turquoise Metallic, Aztec Bronze Metallic, Madeira Maroon Metallic, Plum Mist Metallic, Regal Red, Sandalwood Tan Metallic, Cameo Beige, Chateau State Metallic, and Lemonwood Yellow. Vinyl tops were only available in black. To complement the wide variety of available colors were the available drive train combinations that could be opted for on the 1966 Chevelle. Base power was had by one of two available six cylinder engines. Buyers who wanted more power could opt for a V-8. Big block were in abundance with the regular availability of a 396 cubic inch engine which boasted 325 horsepower, 360 horsepower, or 375 horsepower. Manual transmissions were either 3 speeds or 4 speeds and the only available automatic transmission was the 2 speed Powerglide. 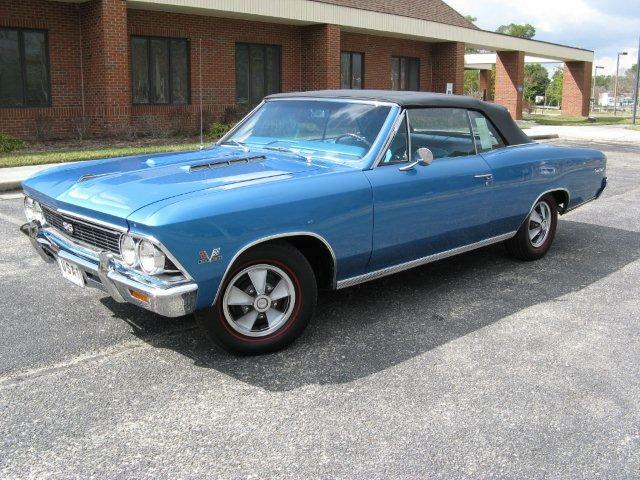 About 471,000 1966 Chevelles were produced.